Peach was the first pie I ever made well. It's the taste of midsummer, with tangy, sweet, and even gooey peach flavor. I like mine simple, with plenty of zest, a squeeze of lemon, and here, the warming presence of ginger. Comfort food for summer, wrapped in an elegant crust. 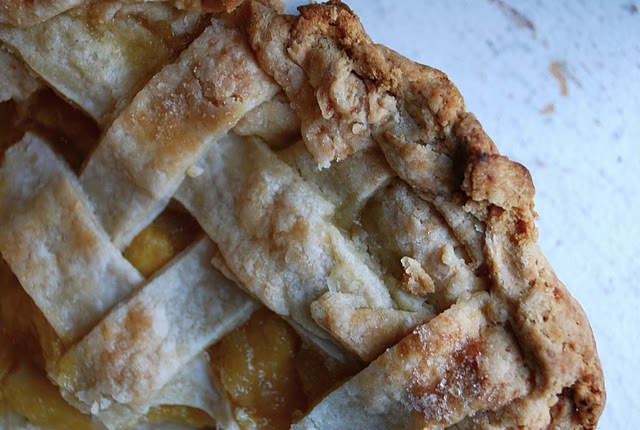 This pie used really ripe, smallish peaches. They were so ripe, in fact, that I peeled the skins right off with my hands. I really only peel my fruit when I want things to be extra fancy. In this case, it was just really easy to do. Watch the liquid content of your filling, and hold back the juices if the filling looks at all mushy. If you are afraid of homemade dough, just try it. Mediocre homemade dough is better than Pillsbury every time.